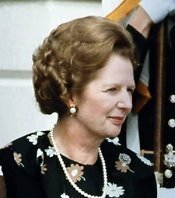 My passion for ice cream is strong ... possibly even strong enough to be likened to the former British Prime Minister Margaret Thatcher's passion for politics! There, I hasten to add, our similarities end - except for one thing that I discovered only a few days ago. ice cream manufacturers were able to produce the same amount of ice cream but using less ingredients, thereby reducing their production costs. the increased air content made for a softer ice cream which the ice cream eating public took to straight away and began demanding more of. the demand for soft ice cream led to the development of the soft ice cream maker where a single cone at a time can be filled on demand. So were it not for the efforts of the 1950's research time and the lady who was to become the first female Prime Minister of Britain, we might never have seen soft serve ice cream chains such as Carvel and many others. Before I read about The Baroness Thatcher's ice cream research work I was already aware that the percentage of air in ice cream made by commercial ice cream producers was a serious and indeed a legal issue. I have a section on ice cream ingredients and within that a page about air in ice cream if you would like to read more.